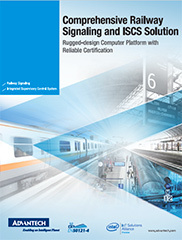 Advantech offers comprehensive solutions of railway signaling and Integrated Supervisory Control System (ISCS), inducing ITA-2000 Series, 3U CPCI, and Ethernet Train Networks. With compliance with EN 50121-4, they are the most suitable for wayside applications, such as interlocking, ETCS/CTCS, designed and functioned as front-end processor for railway ISCS solution, such as FAS, BAS and others. 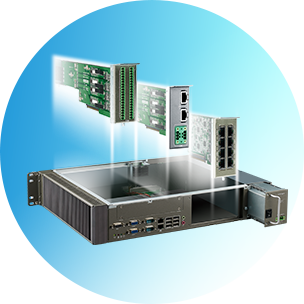 Not only solutions, Advantech rugged computer platform are designed with modular configuration, optional redundant power, and compliant with EN50121-4, building a more secure railway operating environment. Conforms to all signaling and route locks to logical patterns, offering high levels of safety and activating comprehensive diagnostics that automatically reports to maintenance staff. 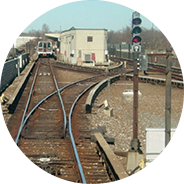 ETCS/CTCS are train control systems sub-divided into several levels. They have two subsystems (on the ground and onboard) using balises, track circuits, GSM-R, Radio Block Center, and onboard computer/communication to control train operations. 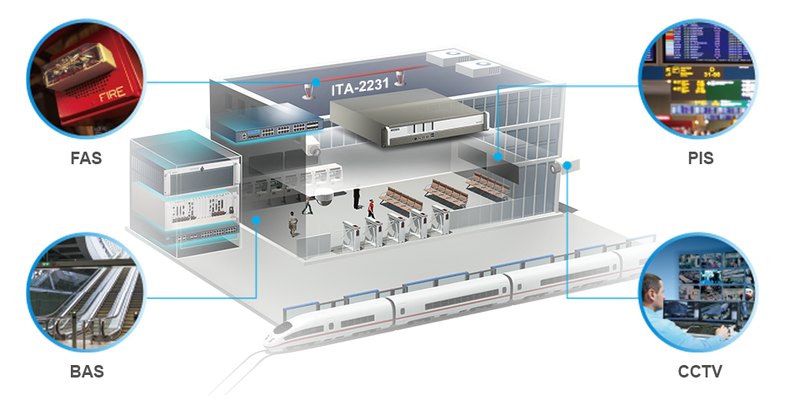 ISCS provides facilities for integrated, centralized and local control as well as supervision of electrical and mechanical subsystems, such as BAS, FAS, PIS, PA and others , located in stations, depots and control center. 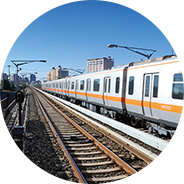 Due to its complicated systems, Advantech provides stable and scalable front-end processor to enable railway operation smoothly and efficiently, and ensure the best conditions for safety and comfort. Building Automation System includes control elevators, escalators, lights, room temperature and others where systems can be activated or maintained 24/7 by industrial computers based on pre-set up data. Fire Alarm System can be divided into central and station level functions. When a fire breaks out, the central FAS serves as a control center, automatically collecting, displaying, recording and storing information for file processing and management. Passenger Information Systems deliver real-time information to enhance passenger comfort and optimize communication between drivers, passengers, and crews efficiently. CCTV systems provide video recorder platforms and tools, such as video surveillance software, intelligent video analytics functions and central management software to facilitate efficient management and monitoring. Supports single/dual AC/DC power module. If one unit fails, another power module will replace it and continue working as normal. 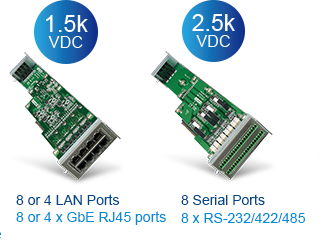 Flexible modular design for multiple COM, CAN, LAN, up to 24 ports max. Includes locking screws for tool-free assembly and easy maintenance. -25~60 °C wide temperature range for operation in harsh environments. CTOS assembly to meet your design requirements. LED Panel on front panel assists ITAM module replacement. 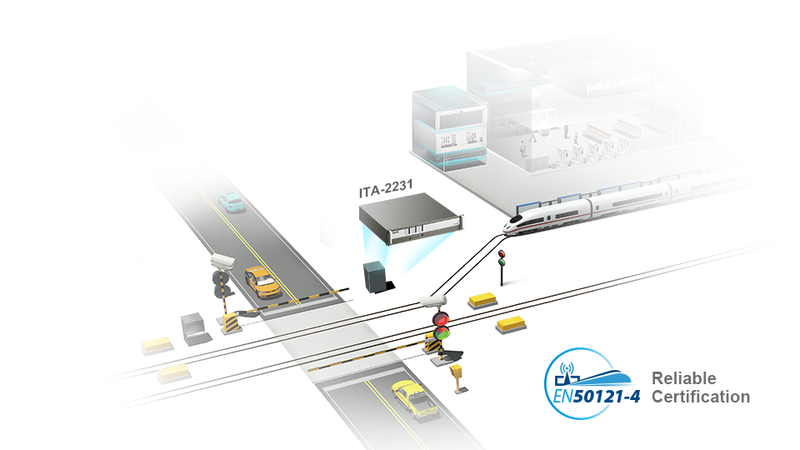 Advantech provides comprehensive solutions for Railway Signaling and Integrated Supervisory Control Systems (ISCS)—Introducing the ITA-2000 Series I/O modules, 3U Compact PCI chassis, and Ethernet Train Networks. With EN 50121-4 compliance, they are designed for wayside applications such as signal interlocking and ISCS. 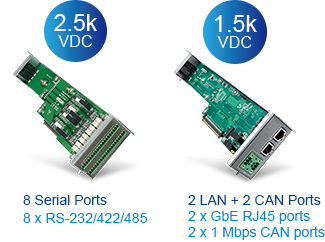 Advantech rugged computer platforms are modular and designed with flexible configuration, redundant power, and safety compliance in mind, building a more secure railway operating environment. We understand you have more questions to ask. Give us a call to get you an answer right away.